Lately, I’ve been visiting the Union Square Greenmarket a lot. I honestly get such a happy high exploring all of the summer crops. I’ve never seen such an amazing assortment of flowering produce before. I saw the most beautiful sage with purple blossoms, broccoli rabi with tons of yellow flowers, and even arugula flowers. Let’s just say the Farmers markets in Toronto do not compare. My favourite stall on Monday is called Lani’s Farm and they have a super smart marketing strategy. All of their produce is paired with health benefits and different ways to cook the vegetable. They even prepare some of their produce for samples. I think this is brilliant because it is easy to get overwhelmed by the selection. One sample of white turnips cooked cilantro and I knew I had to buy a bunch. I think white turnips need more airtime. They are sweet with a peppery taste and the green are delicious when cooked with garlic. Taste aside they are loaded with minerals, antioxidants, and dietary fibre. The greens are even more nutritious than the white roots. The greens are an excellent source of vitamin K, and omega-3 acids, which combat inflammation. 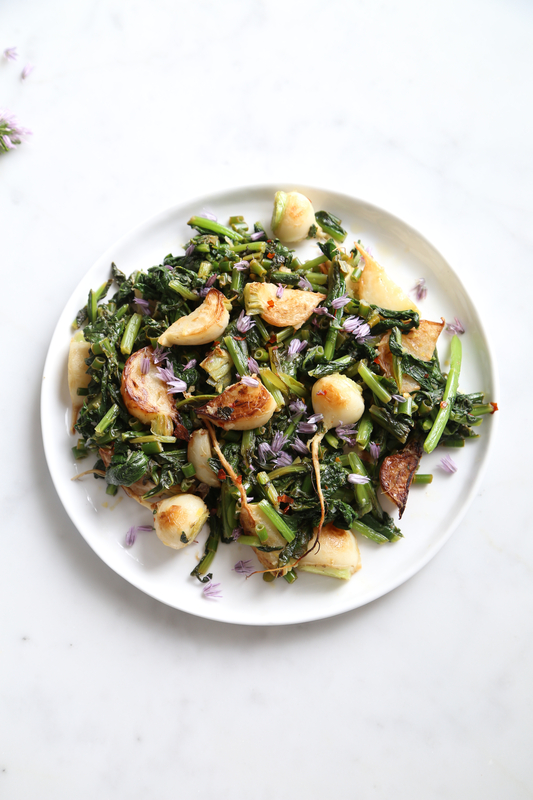 This is a fantastic early summer recipe because it’s likely you can grab a bunch of white turnips with beautiful fresh greens at your farmers market. If you’re lucky you can score a bunch of chive blossoms. Chive blossoms taste like chives and add a stunning touch of purple to the dish. In this recipe I used the chives that were attached to the flowers, which are much more tough than a standard bunch of chives. Either type of chives would work in this recipe. If you can’t find blossoms feel free to garnish with fresh chives. Bring a medium pot of salted water to a boil. Prepare an ice bath in a large bowl. Cut the leafy greens off the turnips. Wash the greens and turnips to remove any dirt. Slice each turnip lengthwise into small wedges about 1/2 inch thick. Add the leafy greens to boiling water and cook until tender, about 1-2 minutes. Transfer to the ice bath to chill. Drain and squeeze out any excess water. Slice the greens 1 inch thick. Heat olive oil in a skillet over medium high heat. Add the turnips cook and until golden and tender, about 5-7 minutes. Add the greens, garlic, chives, lemon zest and red chilli flakes. Cook until garlic is fragrant and greens are heated, about 1-2 minutes. Remove from heat and mix in lemon juice and season with salt. Garnish with chive blossoms and serve immediately. This entry was posted in Starters/Sides and tagged farmers market, organic, plant-based, summer, Vegan, vegetables, Vegetarian. Bookmark the permalink.